Muscles require rest days to grow, but you shouldn’t scarf down the quantity of carbohydrates you do on training days since the demand for carbs can fall considerably when you’re inactive. This is where people often get into trouble—they continue to maintain a high-carb intake on days they don’t hit the iron and aren’t burning through a lot of carbohydrates. The end result? A rise in unwanted body fat, especially around the lower back and midsection. The basics of our lean-mass meal plan sum up what you’ve just learned. As far as portion size goes, the diet delivers a roughly equal amount of protein and carbs for most meals. You’ll eat six times per day to supply your body with critical nutrients, especially aminos, for driving muscle growth, and meal timing focuses around workouts and time of day. On training days, you get to eat more carbs overall (almost 2.5g per pound of bodyweight) and your post-workout meal is loaded with them—the meal plan on page 3 includes 177g of carbs after training. Try this at another time of day and it could lead to fat gain; here it will spur muscle growth. You’ll get most of your carbohydrates early in the day (up to nearly 100g at breakfast), while your later meals are mostly protein. This gives your body the amino acids it requires and negates the carbs it doesn’t necessarily need at this time of day. Since insulin sensitivity tends to be lower later in the day, avoiding carbs helps prevent fat gain. Protein intake stays the same on both days (almost 2g per pound of bodyweight, roughly 330g in our sample meal plan), so the drop in carbs also means a much-needed drop in calories. On workout days you need about 18-20 calories per pound of bodyweight, but on rest days you require only about 12-14 calories per pound. Swapping these days will spur muscle growth without seeing your midsection grow as well. Three cups of rice, pasta, or even a couple of bagels at a single sitting? Sounds like it’d make you fat, right? Not if you consume it along with lean protein immediately following a training session. Carbs remain the mismanaged nutrient. While they have the ability to be stored as body fat, they’re crucial to the muscle-building process. When you eat a lot of carbohydrates after training, it sets off a cascade of hormonal changes that favor the rebuilding of muscle mass. 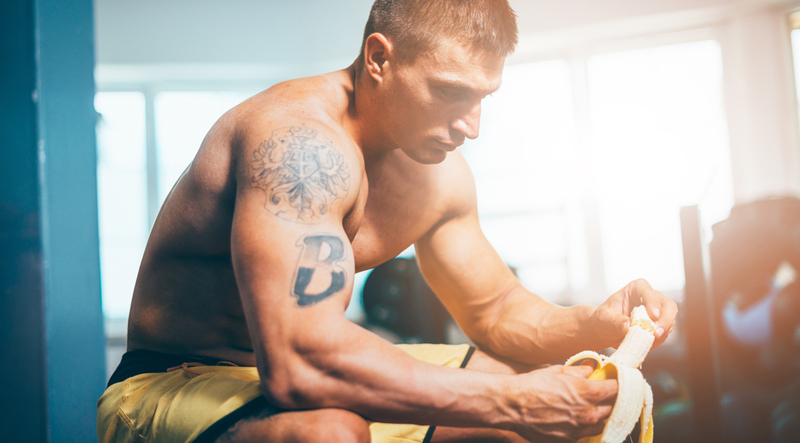 This includes a rise in insulin, which not only forces protein into muscles for growth but also stabilizes testosterone levels, which often fall as a result of too few carbs after training. On the flip side, if you eat too many carbs and just sit around being fairly inactive, some of those carbs might end up as body fat. That’s why you should eat fewer carbs on days you don’t train. While you need them to grow on days you work out, your need for them goes down considerably on days when you don’t hit the iron.